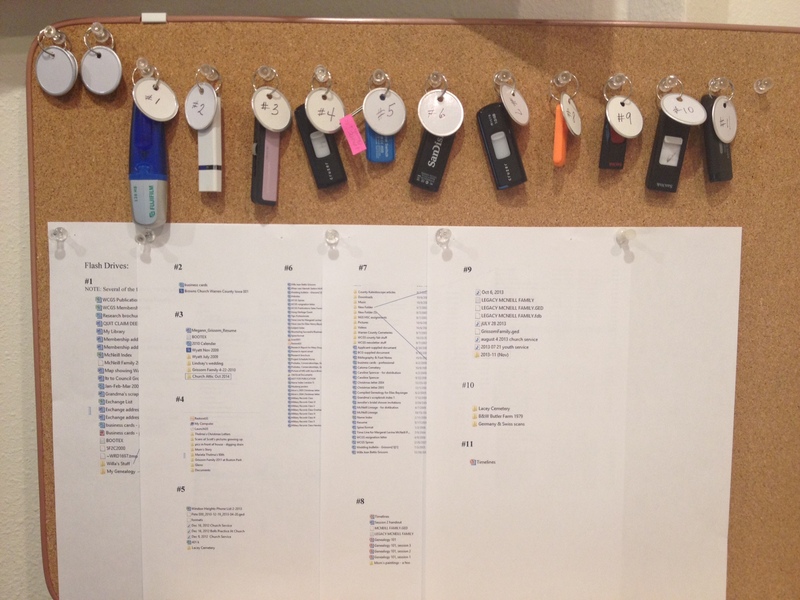 How many flash drives? I started accumulating all in one spot… So far I have found eleven of various sizes, shapes and colors. I’m sure more are hiding around our house. How to organize? How to identify what is on each one? I used the small, round key tags to label each with a number. The number refers to a piece of paper with a copy of the contents which I captured using a “snipping tool” and transferred to a WORD document. Unfortunately, during this process, I did NOT find the missing photos I was hoping might have been put on a flash drive. Perhaps I will find the photos on another flash drive when it surfaces. Remember, however, do NOT use flash drives as a back up. These handy gadgets are not known for stability. Intended use is merely to transfer data or for short term storage. Am I going paperless? Well, not totally… but I’m giving it a try in a couple areas! Recently, I agreed to two volunteer positions: a 3-year term as Elder on our church board and a 2-year term as Secretary for the Iowa Genealogical Society board. Since I’ve read positive comments about Evernote, a note-taking and organizing software, I’m going to try Evernote as a way to take notes and organize the agenda, notes, minutes and other items from these meetings. I’m impressed with the ability to sync the Evernote files on my tablet with my desktop at home without having to use flash drives. SO…………… I’m going to see how it goes! With all of our attempts to organize and reduce the paper we already have in our house, I absolutely must reduce the amount of paper coming into our house. Paperless, as far as I can possibly take it in these two endeavors! I’ll let you know how it goes. I’m on a roll with sorting and organizing! And the roll has gained such momentum that I want to work on it during nearly every spare moment! This is a good thing. I’ve tried to explain previously the enormity of the project I am facing; only my husband really knows. Let me assure you; it is huge! My mother was typical of many (perhaps most) genealogists. She loved to do research and she did a considerable amount. Problems: 1) Mom only documented some of her sources and 2) she had difficulty organizing the information she found. For the most part she used the notebook method, but I’ve found multiple notebooks on the same surname, with much of the same information. To complicate the situation, she created a new family group sheet every time she worked on the family. I find photocopies of the same obituaries in multiple places. And, it isn’t unusual to find information for a completely different family surname stuck in the wrong binder. On top of that, I’m finding Mom was notorious for making notes for multiple surnames on the same piece of paper. Oh, my! It isn’t just my mother’s collection I’m dealing with. My grandmother collected and saved, and my mother inherited a collection from her aunt and uncle. So, when I brought home the boxes, scrapbooks, photo albums, and binders from my mother, the contents was the conglomerate from all of these people. As I’ve worked on the materials, I’ve realized that my mother was overwhelmed! Filing has never been my favorite activity, but I’ve been spending hours doing just that, and sort of enjoying it. I’m filing everything from Mom’s binders and boxes of loose papers into hanging folders in my file drawers. Some people would wonder “Why!” Why shouldn’t I just enter everything directly into a computer program? I’ve asked myself that question, also. However, I concluded that it is easier to get all of the information sorted using a filing system, first. That way when I enter someone into computer software, I’ll have everything that I know about that person in hand and won’t have to keep flipping from one person to another. Mom should have owned stock in sheet protector manufacturing companies. Recently I told my husband that I can foresee the end of using large quantities of sheet protectors. I can see using archival sheet protectors for original documents; not for every family group sheet! I also told him that I foresee the eventual end of using hanging folders. I hope I’ll live long enough to get these files scanned and the data entered into computer software. My goal to eventually write several books. Every step takes me closer to leaving something meaningful for future generations. For now I need to get back to sorting and filing! Yesterday Dave and I spent much of the day travelling from cemetery to cemetery in Wayne County; six cemeteries in all. The inscription included verses from two poets. What a gem! And, who would expect to find a first-class coal mining exhibit in a public library? I recently had lunch with a friend in Waukee and her “drawing card” was to suggest that we visit this exhibit. Of Italian descent, Hiram Ori grew up in the coal mining community in Waukee; his parents and other relatives worked in the Shuler Coal Mine. His estate included a bequest of approximately $700,000 for an addition to the library to feature a coal mining exhibit and a meeting room. The exhibit includes many artifacts, photographs and other documents from the mining community. It also includes some oral histories with memories of mining, the homes, the company store, life in the camp, and Waukee history. All very interesting. With the community’s Italian background, the interviewees also tell about the coming of “the grape train” which brought grapes from California to be made into wine. The story continues with pressing the grapes, preparing the barrels to make a good wine, and the three grades of wine; the best grade was never sold. Another story includes the arrival of yams and telling of youth climbing to the top of the yam-filled rail car and tossing them down to the people standing on the ground. The use of touch screen technology for sharing the oral histories is something I have not seen in a small museum and it certainly adds a new dimension to history. Seeing the people’s faces and hearing their voices as they tell the stories make the memories more personal and meaningful; so much better than reading the story on a piece of paper. I was impressed! By the way, Waukee is probably the fastest growing town in the state of Iowa. There must be many reasons… foresight, education, and inspiration are probably in the list. Fire insurance maps were used from the late 1800s through the 1930s or later by insurance companies to determine how much to charge for insurance coverage. They needed to know the construction materials for the building, size of the building, and distance from water and a fire department. The maps were drawn and colored by hand. Several years ago I attended a free session on Sanborn Fire Insurance Maps sponsored by the State Library of Iowa. The State Library generally offers an assortment of free classes, open to the public, during National Library Week in April. In 2010 Dave and I visited the Library of Congress (LOC) in Washington, DC and took photos of all of the Sanborn maps in their collection for Indianola. The LOC even furnishes a ladder and table layout for researchers to take these photos. Access to view and photograph the maps was not a problem. Then last year a local insurance agency had an open house and a map was on display. As I was admiring the map, the owner asked me if I knew what it was. He was a little surprised when I told him it was a Sanborn Fire Insurance Map. He didn’t expect me to know. Curtis, Peter H., Richard S. Green, Edward N. McConnell, compilers. Fire Insurance Maps of Iowa Cities and Towns: A List of Holdings. Iowa City: Iowa State Historical Department, 1983. The listings are arranged alphabetically by city. Fire insurance maps were often “updated,” instead of being completely redrawn. Therefore, sometimes more than one date is included, i.e., Jan. 1913-Oct. 1932. The first date listed is the date the map was originally drawn; the second date indicates the final update. When I checked the SHSI online catalog, I found that apparently the complete set of maps was filmed in 1985 and it makes up 4,500 pages on microfiche. According to the catalog these fiche are available at both SHSI facilities (Des Moines and Iowa City). I also checked http://www.worldcat.org and found the fiche should also be available at Parks Library, Iowa State University in Ames, Iowa. Note that these are black & white images, therefore, the color coding on the originals is not discernable on fiche. If you are a resident of Iowa, you can view the black & white Iowa only maps online through the State Library of Iowa website once you get a free State Library Card. Link to State Library of Iowa: http://www.statelibraryofiowa.org/. As near as I can tell, this site does not include the Bennett Company maps or the Iowa Insurance Bureau maps. Some large libraries have all the Sanborn maps for the United States available to patrons, via digital black & white images. For example, Midwest Genealogy Center, part of the Mid-Continent Public Library in Independence, Missouri, has the full collection for card-holding patrons on their website. While many of the original maps are located at SHSI (either Des Moines or Iowa City), access is limited to special permission for special needs. General public access is not allowed. The original maps are awesome to study because of the color coding for the various kinds of structures, as well as the other notations about number of stories, and other symbols. I recommend doing an internet search for “Library of Congress Sanborn Maps” and reading the “Overview” to better understand the colors and keys. Then, take a look at some of the 6,000 maps that the Library has digitized and placed online. Unfortunately, no Iowa maps have been included yet. When we visited, I asked what it would take to get some Iowa maps online sooner than later. They would do it for a price, but as I remember the cost was prohibitive. Remember every copy of every map was drawn and colored by hand! These were created before copy machines!